Today is the 64th anniversary of the attack on Pearl Harbor, an attack that killed fewer people, most of them US servicemen, than the attacks on 9/11/01, most of whom were civilians. For my St. Cloud readers, I wanted to bring your attention to http://www.stcloudlawyerlobbyist.blogspot.com, It’s a blog that’s covering the district 15 special election that will be taking place on December 27th. The seat was vacated by Dave Kleis who ran and won the St. Cloud mayorship. The election pits radio talk show host Dan Ochsner against a DFL Lobby Lawyer Hack. Sometimes the liberal positions on the war need to be answered. Here is an answer to one liberal idiot who was on Scarobough Country this evening. I don’t know who this guy was. He is just another mouth without a controlling authority, even his own brain. But he did have a simplistic question that needs to have a somewhat thoughtful answer. Certainly his answer, which was as simplistic as his question cannot stand. His answer is: Of course they will still be blowing each other up. That means we have a war we cannot win so we should leave yesterday. Wonderful logic. And I agree that we will leave Iraq before we are able to insure that there will not be any more car bomb attacks from an insurgency that may take many years to subdue. Defeating the insurgents is not why we are in Iraq. Is it really so hard to remember that we are in a war against the radical Islamic terrorists worldwide? But really, why we went into Iraq is no longer important, the unchangeable fact is that we did go in and we took Saddam out. Now there is a power vacuum where there used to be a powerful central government, and our troops are taking the place of the civil authority that used to rule the country, just like we did in Germany and Japan after our victories there. In WWII we waged a total war against whole countries, killing soldiers and civilians without much distinction. Our Air Forces bombed the civilian population of major cities. Our Armies pretty much destroyed their armies and killed any civilians who resisted us in Germany (and France, Holland, Belgium and anywhere else we fought.) By the time we started the occupation, there was not a whole lot that was not completely destroyed and defeated. We moved in, the reconstruction started, and the population of both countries were far more worried about finding food, water and heat than resisting the forces which were providing the only source of everything needed to live. Iraq, on the other hand was not subjected to a total war effort. We went in to provide a regime change, which we did without really affecting the average Iraqi civilian. We had a counter-force focus of our war effort, and with modern, accurate bombs and lightning-quick ground forces we removed the conventional Iraqi army and disarmed the police forces in the country but did not cause many civilian casualties. Well-planned, well-executed war plans were over in a few days. Mission complete. Job half done. Our combat forces were not really ready to provide the martial law that was needed on the heels of the war effort. The terrorists, against whom our complete war objectives should have been aimed, were not affected by the conventional troops we deployed. We stood around as the terrorists were able to arm themselves with what remained of Saddam’s arsenal. Chaos prevailed until we got our act together and started acting as an occupying army instead of a conquering one. One step forward, one step back. Saddam gone, but now we had to provide police presence and start up a civilian government. New goal, new mission, and right now a job only half done. Because our Army and Marine forces were the power in Iraq, they provided terrorists with an American target that they could reach. Terrorists have flooded into Iraq. They have joined the remains of Saddam’s regime who would like to regain power and a few native Iraqi terrorists as the main opponents to the forces of law enforcement in Iraq. It is sort of a Catch-22. Because we are there, there is an added terrorist threat. Because of the added terrorist threat, we need to be there. What is now left is a law enforcement problem. As the new Iraqi government is formed (remember, the new Iraqi government has not been elected yet) the responsibility of ensuring the domestic tranquility will shift over to them. They will be able to use the Army fragments we are now training, and the police forces we are training against the forces who oppose them. We must stay there until they can hold power by themselves. The only thing a government is is the force that enforces the laws and customs of a country. Iraq is not really a country yet, just a loose confederation of provinces. Maybe it would be easier on everyone if we broke it apart into three countries, a Kurdish one, a Shiite one, and a Suni one. As attractive as this sounds, we have to remember who our war is against. Radical Islamic terrorists. If we break Iraq apart, there will be three power vacuums. Somewhere in there, there will be a new Taliban which will harbor terrorists, a result we cannot allow. So we have to spend the time and blood that it requires to subjugate the whole country enough so that the Iraqis themselves can survive the chaos which will come after our major forces leave. A leading lingerie company has joined Japan’s fight against high fuel use, unveiling a heated bra for winter. The fluffy creation contains special pads filled with an eco-friendly gel that can be easily heated in a microwave or with a hot water bottle. The design also includes a furry boa designed to double as a winter scarf. Lingerie giant Triumph unveiled the bra months after PM Junichiro Koizumi urged Japan’s office workers to ditch ties to save on air conditioning. Being padded, the new bra packs a little more bulk than most regular designs, but the Japanese arm of Triumph insisted the look was more chic than sheep. “We hope this will not only help prevent global warming but also provide a little fashion chic to the office,” the company said in a statement. Women across the nation can be found at fitness centers using stair climber machines, engaging in aerobics and pilates to achieve a slender body, and to make their bottoms look firm. Now you can more easily achieve the buttocks you envision, on top of your physical training by using the Bottom Reformulator. It’s been designed by a team of plastic surgeons from Taiwan to enhance the shape of your buttocks and to make them appear more toned and tight. These doctors concluded that body pressure on a curved memory-foam pillow can, after an allotted period of time, reshape your bottom. 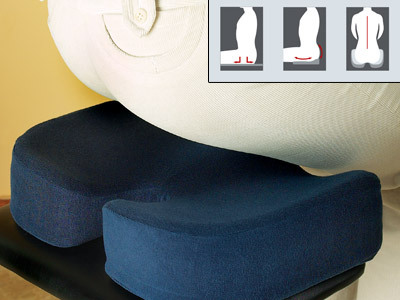 Use our memory foam cushion to curve your bottom just the way you want it to be shaped. You’ll be on your way to attaining that starlet figure with the Bottom Reformulator. It’s been vigorously tested and is proven to work. You’ll see results within 90 days. One nice thing about the Hypertext Transfer Protocol that runs the web (HTTP for short) is that it includes helpful status codes such as “404 Not Found” when a resource can’t be found and “403 Forbidden” when the web site you’re knocking at does not want you to come in. One rarely seen status code is the elusive “200 OK” which basically means that everything went fine, and you’re seeing the page you’re supposed to be seeing! We thought it sure would be handy if life came with status codes, but since it doesn’t, we did the next best thing and printed them on stuff you wear. But not just any old stuff – we had to try something different, and print them on undies. So we bring you HTTPanties for the discriminating woman who would prefer a web-savvy and somewhat-direct approach in the romance department.